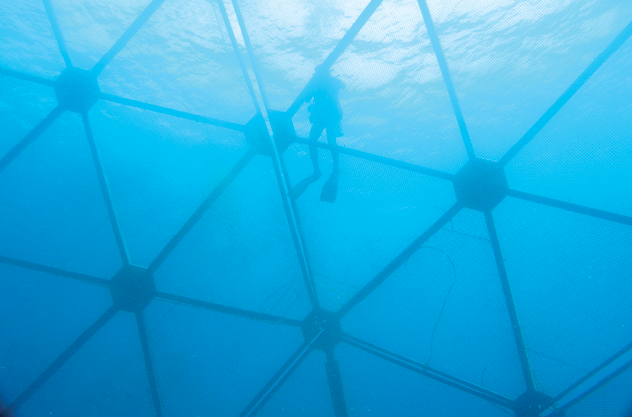 Miles off shore, anchored in carefully selected currents, the pens of an open ocean farm can look like submerged circus tents or huge geodesic bubbles. Tougher than their close-to-shore cousins, these giant operations are capable of raising thousands of tons of bass, snapper, tuna and other ‘finfish’ while staying relatively close to customers in what is now a global market for seafood. The remoteness of these operations offers a number of advantages, including cleaner water and potential economies of scale. But operating at such distances poses challenges in even the most benign environments. The fish in these underwater corrals will need tons of feed delivered daily and their enclosures cleaned as well as regular monitoring and in some cases medical treatment. All of these functions and others are, or can be, supported by robotics and autonomous systems—in fact integrating unmanned systems is essential for open ocean farming to succeed. “It takes a certain amount of automation to make (open ocean aquiculture) viable,” said Donna Lanzetta, the CEO of Manna Fish Farms. It doesn’t work, especially miles offshore, she said, unless there’s automation and robotics involved. Lanzetta should know. She is in the process of setting up a multi-trophic farm 16.2 miles off the coast of Eastern Long Island. Starting with one enclosure or pod she plans to grow her farm into a 24-pod operation focused on raising striped bass and eventually tuna. Interspersed among the pens will be equipment to grow mussels and clams, which are not only saleable but naturally help clean the water. She also has plans to grow kelp and other marketable seaweed including a particularly interesting species called dulse. “I heard that when you pan sauté it, it tastes like bacon,” Lanzetta said. Part of what spurred Lanzetta to launch Manna Fish Farms—which will be the first such farm on the East Coast and perhaps the first in the entire United States—is the rising demand for food, especially protein. The world’s population is projected to increase dramatically over the course of this century rising from 7.3 billion in 2015 to 9.4 billion in 2050, according to projections from the U.S. Census Bureau, said Hauke Kite-Powell of Woods Hole Oceanographic Institution (WHOI). Earlier projections for the maximum human population on the globe also have been resized upwards, he said. “We’re definitely poised to exceed the 9 billion mark before too long and that means a lot more people to feed, he told a Jan. 11 workshop on aquaculture organized by WHOI’s Center for Marine Robotics. Not only is the number of people growing, the demand per-person for protein is rising as people become more affluent. It has been years since the wild fish supply has been able to meet demand, he told attendees. The world’s appetite for fish is driving growth in aquaculture and that growth is likely to accelerate, Kite-Powell said, but many of the really good, near-shore locations for new operations are either already being farmed or are being used for other things. For that reason he sees marine production moving further away from the coast to open ocean farms, a new form of offshore aquaculture called mariculture. But where will these farms be located and what kind of technology will they need? While the potential for mariculture is vast, certain environmental conditions are necessary for an open ocean farm to be successful. There are some 190,000 square kilometers of the world’s oceans that are particularly suited to open ocean aquaculture, according to a 2013 study by the United Nation’s Food and Agriculture Organization. To get to that number researcher James Kapetzky started with the world’s exclusive economic zones (EEZ), that is the regions off a county’s coast where a state has special rights regarding the use of marine resources. He then looked at the temperatures, depths and currents in those areas to see where three representative species—cobia, Atlantic salmon and blue mussel—could be raised successfully. He eliminated from consideration those areas that were more than 25 nautical miles (46.3 km) from a port as not being cost effective, leaving a total of 189,468 square kilometers that would work well for open ocean fish and mussel farming. The FAO also found that, so far, very little of that potential has been realized. With demand surging and plenty of room for new farms, the mariculture industry appears poised for a boom. The demand is going to be there, asserted Kelly, the former CEO of autonomous underwater vehicle maker Bluefin Robotics. Kelly is not the only one who thinks so. His firm has benefitted from venture capital and there was at least one potential early-stage investor in the WHOI audience. Though it is hard to say how many investors are specifically interested in open ocean farming, Angle.co, a website dedicated to startups, has 54 companies and 974 investors on its list of aquaculture angel investors. “There is getting to be more focus and buzz around it,” he said. 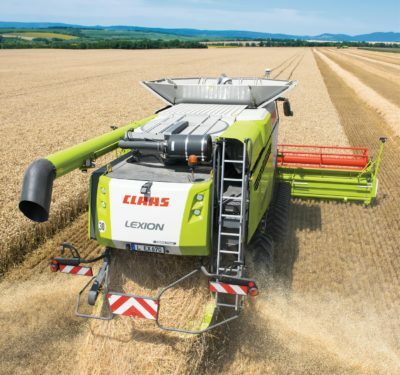 The market potential extends beyond the farms themselves to the sectors that support them, the experts suggested. Robotics and automation are already used in farms today, Kelly said, especially for feeding. When you consider the scale of operation at an industrial finfish farm it’s easy to see why. The feeders are automated and deliver the food to the fish through a tube, Lanzetta said. Cleaning the pens is also a huge job. Both Kelly and Lanzetta would like to find the equivalent of an underwater Roomba—a robotic system that would, without a lot of human interaction, keep enclosure walls clean. Biofouling causes increased drag on the equipment. It also reduces the water flow through the cage and therefore the amount of dissolved oxygen reaching the fish—causing stress. Unfortunately, Kelly said, the capabilities of the systems available today are limited. The problem is the current generation of pen cleaning equipment is a “brute force” solution that is clunky, difficulty to use and heavily operator dependent, Kelly said. The level of operator involvement is a key metric because many mariculture operations will be located in areas where highly trained workers, like those supporting the oil and gas industry, are unlikely to be available. The oil and gas industry is also a good analogy for how tough any mariculture equipment has to be. Equipment needs to be robust and easily maintainable, Kelly said. There is also an opportunity for unmanned systems that can help get fish to market. When the fish are fully-grown and the harvesting finally begins, farmers don’t want to leave a single fish behind for both economic and environmental reasons. Harvests take place over a number of days, typically by crowding the fish and then removing them from the pens. While it’s not yet clear how robotics might solve the last-fish problem, unmanned systems have a clear advantage when it comes to another big job—the transport of mariculture pens. Pens might need to be moved from the main operation to be cleaned or transported to waters better suited to a different species. This mobility is one of the advantages of mariculture, which will be in a better position to avoid the sort of ocean changes triggered by global warming. To handle the task Goudey is proposing a diesel powered TowDrone that uses two slow turning, large-diameter propellers—like those used to mix waste water ponds—to maneuver even the largest enclosures into place at a safe snail’s pace. A TowDrone might also play a roll in treating fish that are ill. For example bathing farmed salmon in fresh water appears to be an effective treatment for amoebic gill disease and sea lice, parasites that feed on fish, according to a research paper in the Nov. 2105 journal Aquaculture. The challenge is getting fresh water to the fish. “Right now they’re using well boats and large tankers to do this,” Goudey said, but farmers are considering hauling in fresh water in large flexible bags—bags that could be gently towed to the farm site. 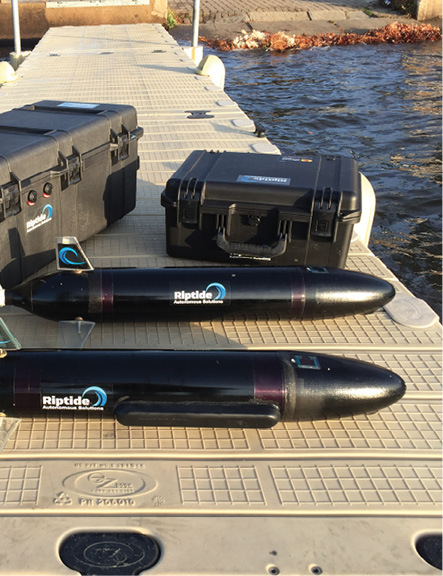 It might be possible to get an early warning of lice or other problems if unmanned underwater vehicles could be used to better monitor fish stocks. Lanzetta was intrigued by discussions of a UUV made to look and act like a fish. “We might be able to pick up challenges early” if there was a way to put cameras in the tanks to swim with the fish to monitor their behavior, she said. Sensors on underwater vehicles also could be used to help search out new mariculture sites, test continuously for environmental changes and warn of conditions leading to problems like toxin-laced algae blooms. One of the issues with putting sensors other than cameras into a mariculture operation is that most of the sensors now available are intended for scientific use. As such they are expensive and require frequent calibration. Kelly said he wanted a sensor he could put in place and leave unattended for 6 months to a year. Lanzetta is looking for something more simple. She said she would really like a way to clean the fixed cameras she plans to use for monitoring. 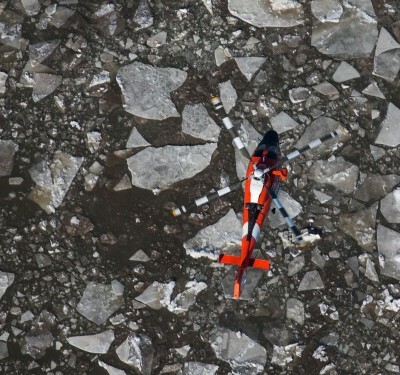 Trimming the number of manned dives and other new efficiencies will likely be the key near-term opportunity for unmanned systems, Kite-Powell said. Mariculture is inherently more expense than near shore operations, he said, but robotics and automation can help level the playing field. 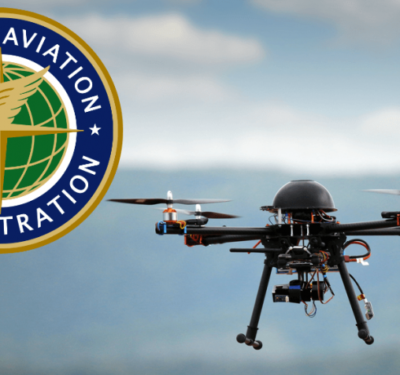 The immediate opportunities lie in efficient unmanned systems that can lower operation costs. Kelly agrees that any new equipment has to improve the bottom line. Aquafarmers use technology and will adopt new equipment that is useful, he said, but they are price sensitive and hard-nosed. Despite the challenges, Kelly said he sees major advances in the next 5 to 10 years. It is new technology, particularly unmanned systems, really shift the way seafood is produced, Kite-Powell said.